With Halloween coming up tomorrow, we wanted to share a few facts on the sweet stuff (or not-so sweet stuff): sugar. So read on as guest blogger Courtney Failla, a dietetic technician for EverydayHealth.com and its calorie counter tool, fills us in on what we need to know before we trick or treat (or just have all that leftover Halloween candy that’s calling our names)! All Hallow’s Evening originated as a day to honor the spirits of the deceased and the coming of winter. As far as I’m concerned, the only purpose of October 31st (and the week after, and before, and pretty much the entire month of October) is to see how quickly you can bring on the sugar-induced coma that will inevitably result from eating an entire bowl of Halloween candy. You know the feeling, right? You pick up a bag of candy and a cute bowl with little ghosts on it to place at the edge of your desk, thinking it would be a nice gesture to offer your coworkers a sweet treat. At no point does it occur to you that you’re going to be staring at this bowl of candy for 8-plus hours a day. At the end of those 8-plus hours, you realize you’re sitting at a desk that’s covered in wrappers with an empty bowl, a stomach ache and a desperate need for a nap, with no recollection of how it happened. It’s like magic, isn’t it? It’s easy to lose sight of the amount of sugar consumed during a holiday that’s entire existence is devoted to candy and caramel apples. And when you live in a country plagued by obesity and diabetes (diseases in which sugar consumption plays a huge role), it’s important to pay attention to how many sweets we’re consuming. When we think about eating right during the holidays, it’s easy to forget about Halloween, which is a holiday of long-term snacking, rather than “stuffing” all of your poor eating choices into one meal like on Thanksgiving and Christmas (pun intended). 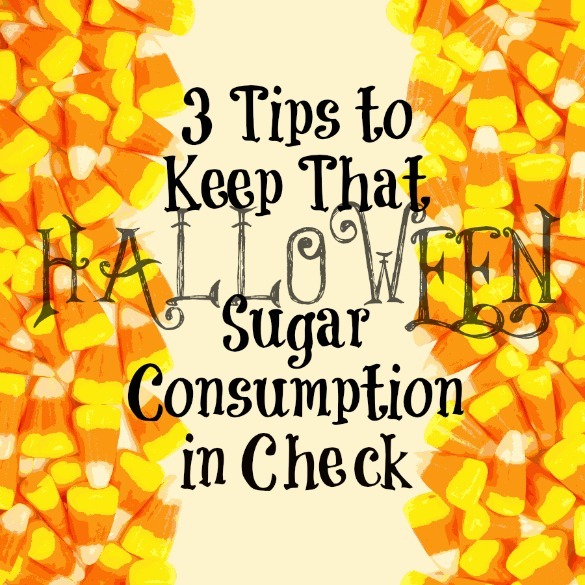 By following these three simple rules, moderating your sugar consumption this time of year may become doable. 1. Have a snack, not a meal. One of my previous employers kept this sign above a bowl of candy that he left outside his office door for others to enjoy. It would be a sin to completely abolish Halloween candy from your diet. (What fun is Halloween without candy?!) So instead of eating the entire bag, eat one or two pieces. A little bit goes a long way. 2. Out of sight, out of mind. As I said before, my boss kept a bowl of candy outside his office door for others to enjoy, the keyword here being OUTSIDE. If he had to get up from his desk to go get a piece of candy instead of simply reaching across his desk, he found that he was much less likely to eat it. Smart man. 3. Choose wisely. The sugar content of candy differs greatly. A bag of Skittles contains a whopping 47 grams of sugar. A roll of Smarties contains only six grams. The internet has a plethora of information regarding the sugar content of all your favorite candies. Use it to your advantage.